Thursday, February 9, 2017 5:30 PM Lapel High School AWAY 12 Daleville High School HOME 90 Meet Recap Daleville Jr. High wrestling remains undefeated on the season. The broncos were led today by wins from Blayke Johnson, Robert Wilson and Brandon Kinnick. Great job Jr. High ! Saturday, January 28, 2017 9:00 AM Place 5 Points 118 Meet Recap Daleville wrestling finished 5th at the Delta Sectional. 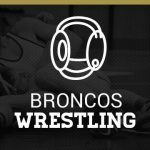 The Broncos advanced 7 wrestlers and an alternate to the Jay County Regionals. This is a school record in Regional participants. The Broncos were led by Corbin Maddox whom won the 220 pound weight class. Tuesday, January 17, 2017 5:30 PM Daleville High School AWAY 72 Highland High School HOME 39 Meet Recap Junior High wrestlers wrestled Highland Middle School last night to a 72-39 victory. Broncos were led by Andrew Skinner, Blayke Johnson, and Hunter Hoss. Congratulations to the Bronco wrestlers. Monday, January 9, 2017 6:00 PM Daleville High School AWAY 54 Decatur Central High School HOME 51 Meet Recap Middle school wrestlers defeated Decatur Central 54-51. Wins by Andrew Skinner, TJ Fritz, Brandon Kinnick, Julius Gerencser, Max Nasleroad, Bracken Womack, Anthony PeÃ±a, Hunter Hoss and Blayke Johnson. The JH wrestlers will compete in a dual meet this Thursday Jan. 12th at home prior to the varsity match against Madison Grant. The JH wrestlers will compete against Muncie Northside starting at 5:30 pm in the Main gym. Come out and support the wrestlers as they compete at home for senior night. Go Broncos!